Yalta is a resort city on the north coast of the Black Sea in the Crimean peninsula, a territory recognized by a majority of countries as part of Ukraine as the Autonomous Republic of Crimea but administered by Russia as the Republic of Crimea. 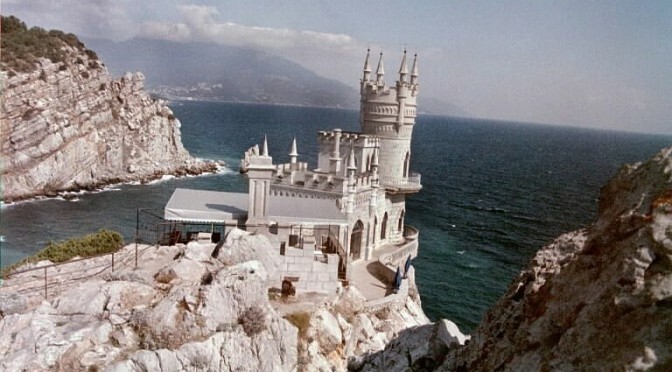 It serves as the administrative center of Yalta municipality, one of the regions Crimea is divided into. These pictures were taken in October 2000. Livadia Palace was a summer retreat of the last Russian tsar, Nicholas II, and his family in Livadiya, Crimea. The Yalta Conference was held there in 1945, when the palace housed the apartments of Franklin Delano Roosevelt and other members of the American delegation. Today the palace houses a museum, but it is sometimes used for international summits. Vorontsov Palace or the Alupka Palace is an historic palace situated at the foot of the Crimean Mountains near the town of Alupka in Crimea. The Vorontsov Palace is one of the oldest and largest palaces in Crimea, and is one of the most popular tourist attractions on Crimea’s southern coast.